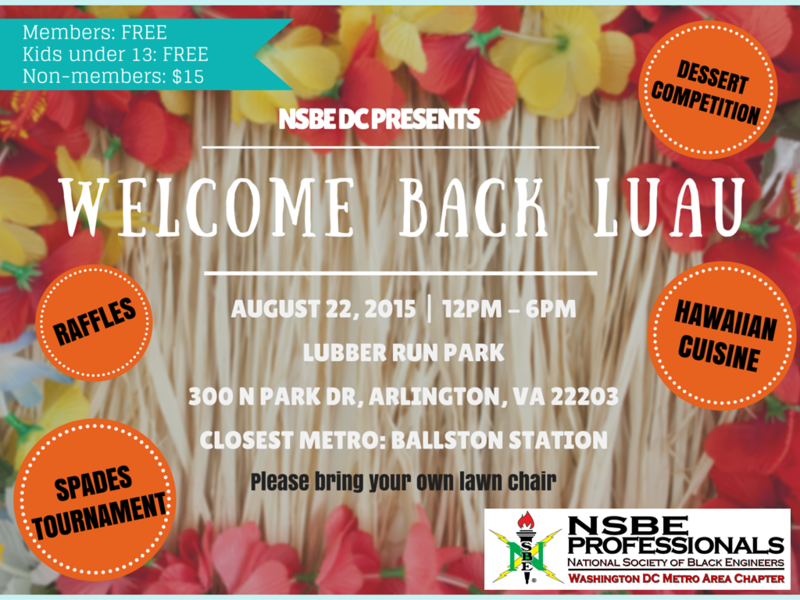 National Society of Black Engineers, Washington DC Metro Area Professionals Chapter (NSBE DC) - NSBE DC Cookout: Welcome Back Luau! NSBE DC Cookout: Welcome Back Luau! so we're bringing the tropics to us at the Welcome Back Luau! You are warmly invited to celebrate with NSBE DC family and friends at the annual membership cookout. Join us for a fun-filled day of festivities with Hawaiian cuisine, a spades tournament, dessert competition, musical entertainment, spirited Hawaiian-themed competitions, and much much more! 5. There will be onsite registration on the day of the cookout! 6. Become or Renew your NSBE DC Membership today and get into the cookout for free!